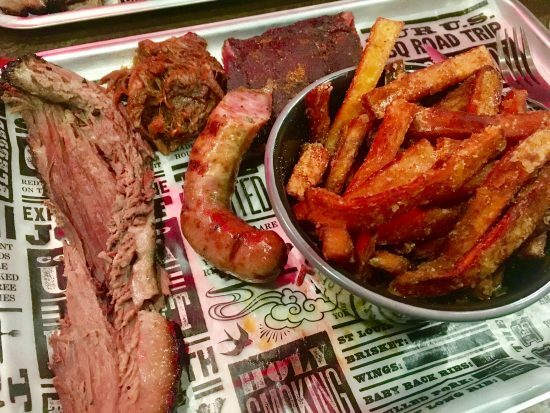 Red's True BBQ Newcastle, Review: Sweet Dreams are made of MEAT! 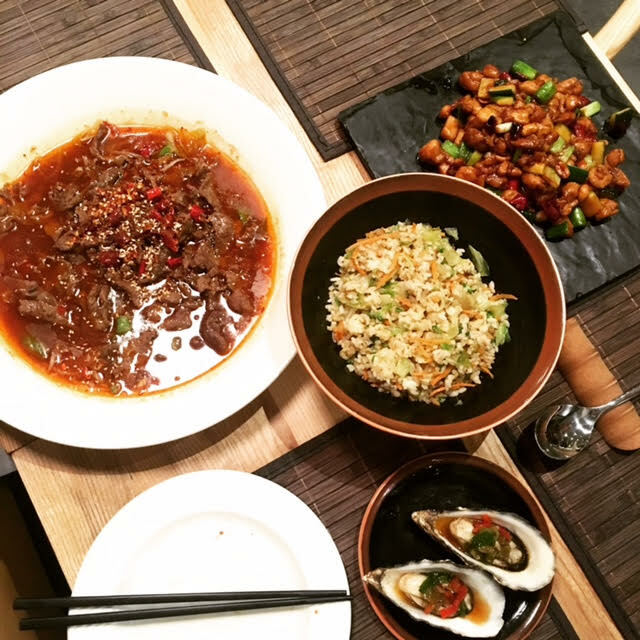 I’m writing this review in the midst of a diet, so it’s going to be pretty difficult to reminisce back to a time of meat that falls off the bone, but that’s the perils of being a food blogger. Sometimes, these endless foodie encounters catch up with you and you’ve got to board the clean eating bandwagon, with memories of happier plates gone by. Last week, pre-diet, we headed to Red’s True BBQ, Newcastle on a random, rainy Monday evening. Situated in Eldon Square’s snazzy new food quadrant, Red’s is a meat-lover’s dream. 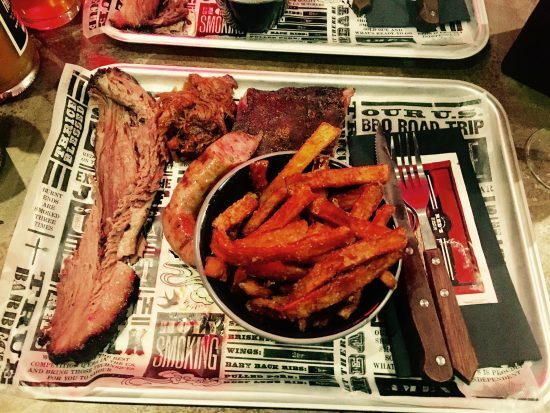 Think sweet, smoky BBQ-d ribs, brisket, pulled pork and a whole manner of other carnivorous treats. The concept is simple: good meat, cooked well, with an array of signature sauces to pair them with, changeable sides and big platters of food. We were seated in the downstairs restaurant area that backs onto the corner of Clayton Street. 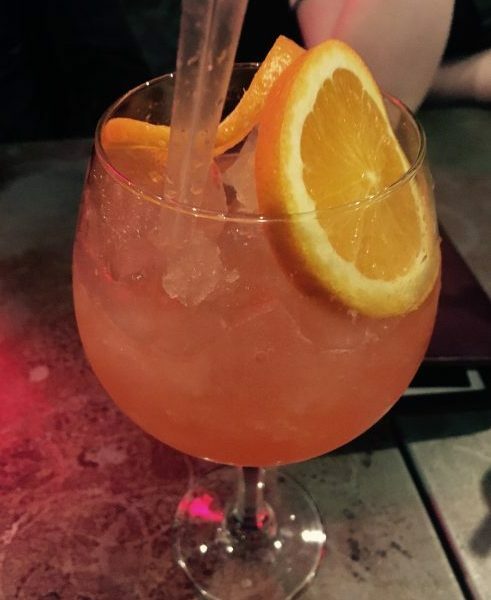 There’s plenty of tables, a large bar boasting all manner of spirits and trendy IPA’s and what I wasn’t expecting, a pretty banging cocktail list. 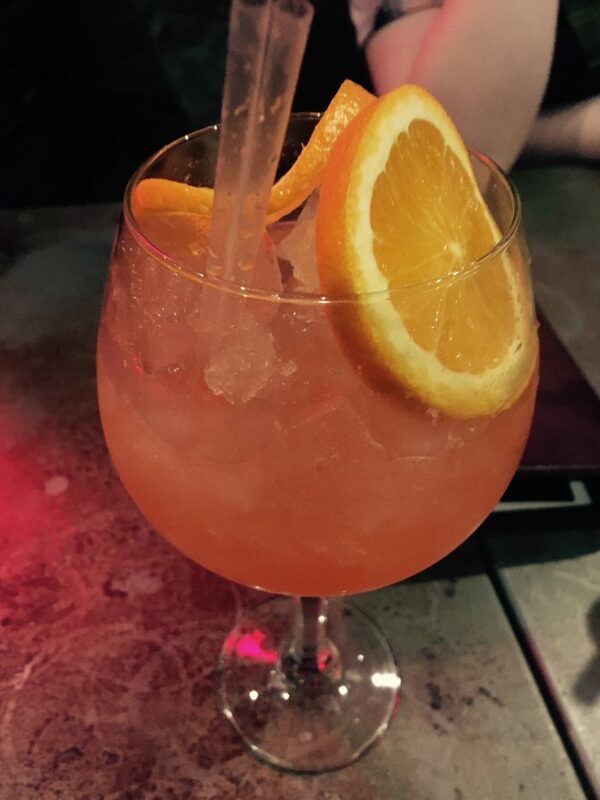 After laughing off the last of my Dry January intentions, I opted for the Blood Orange Spritz (£6.95), which was a zesty, bubbly concoction of Aperol, Tanqueray, Prosecco, Blood Orange and lemon. I absolutely loved it, I’m not gonna lie. They weren’t shy with the booze and the Blood Orange was so zingy! Later I was to discover that this would be a great accompaniment with my main course. My pal (and fellow blogger!) Danielle went for the Cider Fruit Cup (£6.95), a fruity explosion comprising of raspberry cider, Pimm’s, strawberry jam, cherry, cranberry juice, Crème de Mûre and mint. Super tasty and very refreshing. The lads, aka my boyfriend and my brother, went for pints of Identity Theft APA (£4.80) each, because they’re lads. 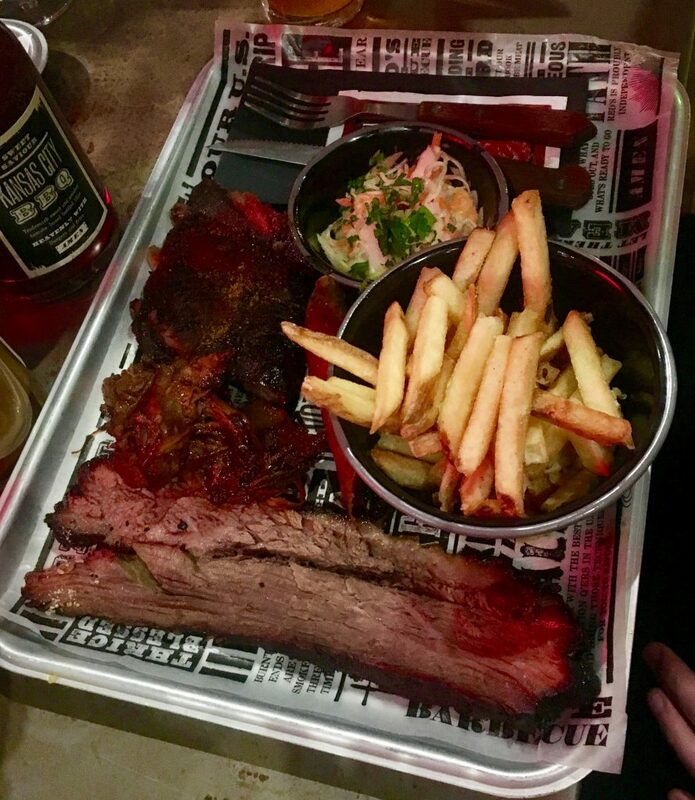 We weren’t feeling too adventurous on the food-ordering front, so each went for the Pitmaster Tray (£18.95) with a variety of sides, the price of which was included. A Red’s True BBQ “cult classic”, so to speak. If you go for their regular sides, you can get 2, but I decided to go for a “Divine” side of sweet potato fries (£2.95). Not sure why so many places still think sweet potatoes are some sort of forbidden delicacy, especially when I just picked up a bag of the buggers from Sainsbury’s at a mere £2, but at the moment, sweet potato is still the *it* thing, so prepare to pay more for them until the hype dies down a bit. My boyfriend went for the “Humble” fries, the bloody peasant! But what about the meat, I hear you cry! Well, needless to say, it was pretty damn special. Red’s True BBQ certainly does what it says on the tin. St.Louis ribs, Black Angus brisket, Red’s pulled pork and a smoked sausage all plonked plentifully on a metal tray with greaseproof paper, allowing for dollops of sauce to be poured wherever your heart desires. Everything on the platter was well seasoned, super succulent and just so delicious! I couldn’t get enough of the pulled pork, in particular. It was moist and a little tangy, and went particularly well paired with Red’s ‘Triple 6’ hot sauce. The rib-meat fell off the bone and the slightly-sweet charred outside of the meat gave it a little crunch and texture. I seemed to have a particularly fatty bit of brisket, so that was a slight disappointment, but after a little trimming, I got over it and chowed down on the rest of my platter. The sausage, smoky and a little spicy, was a welcome addition to the whole arrangement. My super-expensive sweet potato fries were nice and crispy, and to be fair, there was plenty of them. Other sides on our table included the Buttermilk Slaw, which was nice and crunchy (well, duh!) and a refreshing accompaniment to the meat-fest. My brother got the BBQ Pit Beans, which I think he regretted in hindsight, but for any bean advocate, prepare for 12-hour smoked beans packed with burnt ends, pulled pork and onions. In the wake of all the meat on the platter, I don’t think he needed the extra bits within the beans, so take heed of his error, dear readers! There was absolutely no chance we were having a dessert, and as the restaurant started getting busier (thanks to a big birthday party and a VERY loud waiter! ), we decided it was time to scoot off. The service throughout was friendly, and we were pretty much left to our own devices and not particularly ‘bothered’ by anyone, which I appreciated given that the majority of the time I had a rib bone hanging out of my mouth. There’s nothing worse than having to say “yeah good thanks” to waiting staff with half a cow or whatever in your mouth. Being modern-day professionals and all, we split the bill four ways, and it worked out at a very reasonable £27 each, including tip. Not bad really for delicious cocktails, decent ale and a LOT of meat. I’d say yes, but it’s probably not somewhere we’d make a habit of going to a lot, if that makes sense. It’s more of a rare treat kinda place, not because it’s expensive or anything, but mainly because it can’t be healthy to consume that amount of smoked meat and sweet sauces. It just can’t be. The food was very good indeed, and for such quality and a very decent cocktail to go with it, I thought it was well worth the money. As Red’s True BBQ say themselves: LET THERE BE MEAT! All food and drink was paid for by ourselves and as always, all views are true to experience. 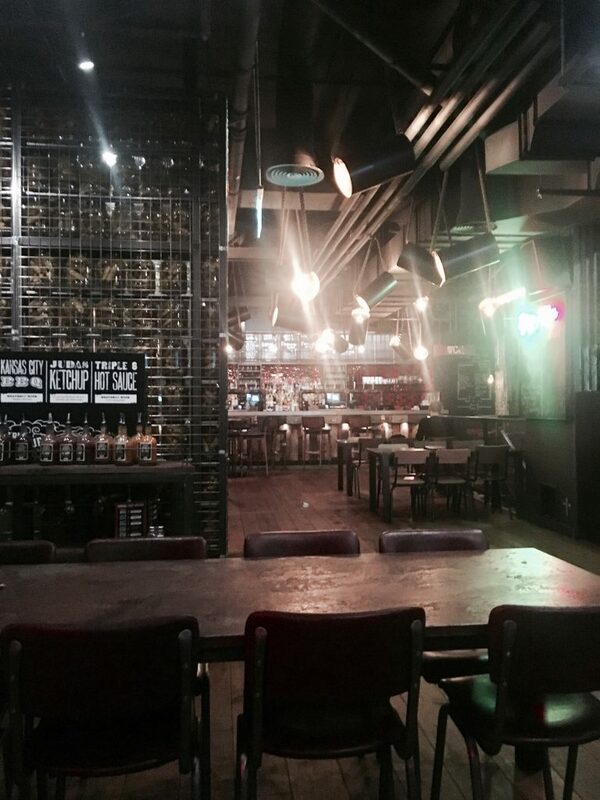 Find Red’s True BBQ at Grey’s Quarter, intu Eldon Square. For more info on menus, vegetarian and vegan options, check out their website HERE. Reds’s True BBQ are taking part in NE1’s ‘Newcastle Restaurant Week from 16th-22nd January. Find out more about the offer right HERE! A Damn Delightful Birthday Dinner: Café 21. 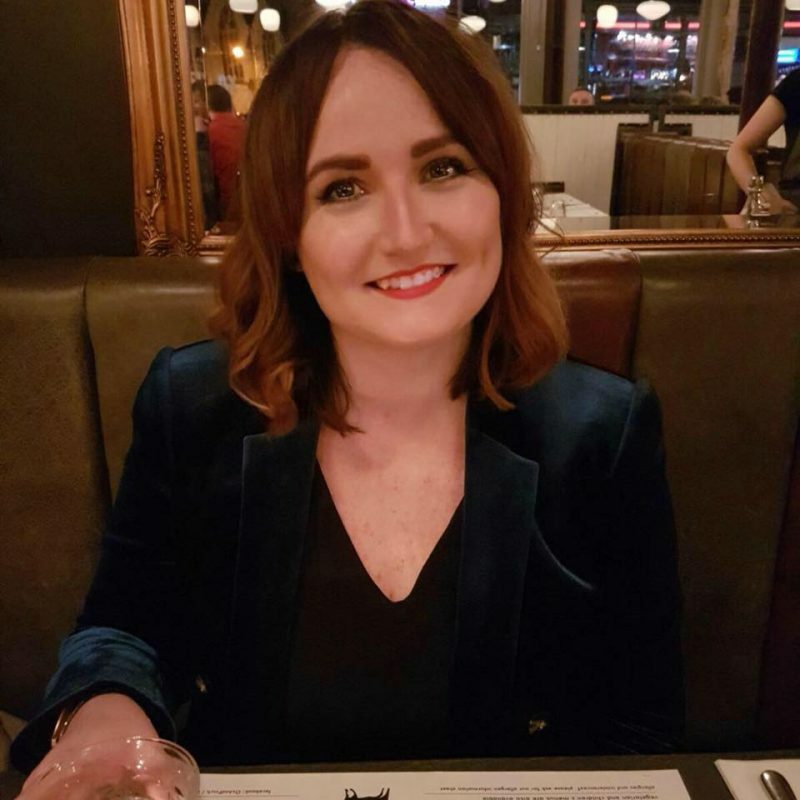 Previous Post My Top 5 picks of Where to Eat this Newcastle Restaurant Week! 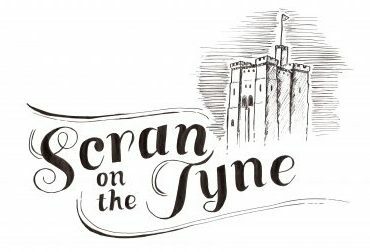 Next Post Chaophraya Newcastle Review: The verdict on the Toon’s newest Thai spot!